These masks are not too similar across our metrics. With a similarity score of 55%, we think you will prefer the Garnier mask. While it's a dollar more for just one mask, we think you will want to treat yo self to the name brand. Not a great comparison, but both masks are a nice experience. A mask always feels like a decadent treat. When we picked up these moisturizing masks, we were expecting extreme moisture. We got it from the Garnier Moisture Bomb mask. It was a nice blue color, and there was a solid amount of gel on the sheet. This mask had a cooling effect, and we could feel it working while on. 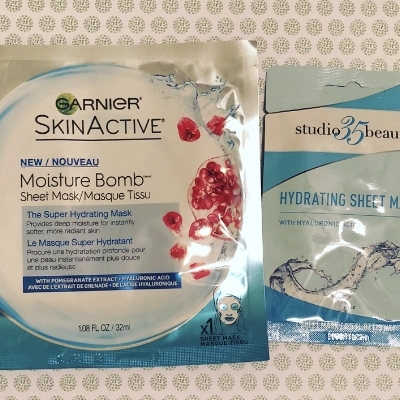 The Studio 35 Beauty mask from Walgreens, on the other hand, is a simple white sheet mask. It also provided moisture, but there was no cooling effect. The scents of the masks are fairly different, but neither smell is offensive. Additionally, the ingredient panels are only 30% similar. We feel that if you are going to treat yourself to a mask, you should really go for it and get the Garnier sheet mask!